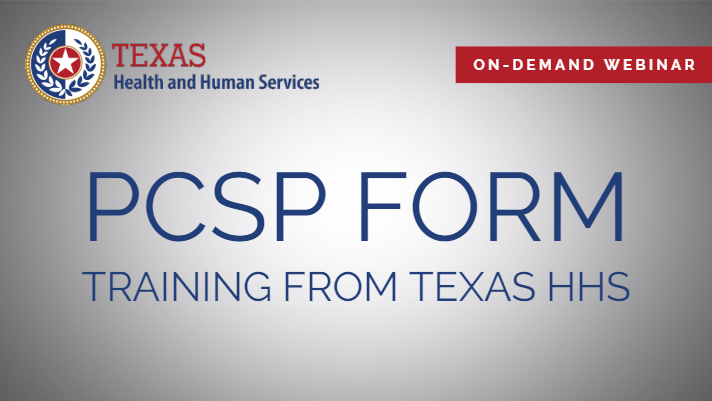 From Jan. 11–22, Texas HHS sponsored a series of statewide training events on the new PCSP form. This training is important for all Texas SNFs and mandatory for all Local Authority (LA) staff who work with PASRR. You must attend the entire webinar session (start/stop times will be recorded). If you do not attend a live training or attend the live webinar, you must watch the webinar recording before asking HHS PASRR questions about the PCSP. As Health and Human Services (HHS) announced in November’s Long Term Care Bulletin, local authority (LA) and nursing facility (NF) providers will have access to a new PASRR Comprehensive Service Plan (PCSP) form, replacing Interdisciplinary Team (IDT) Meeting and PASRR Specialized Services (PSS) forms. The new form will be available to both SimpleLTC customers (via SimpleCFS™) and users of the TMHP LTC Online Portal beginning Jan. 26, 2019. New IDT and PSS form submissions will not be accepted after Jan. 25, 2019. You can access the new PASRR Comprehensive Service Plan (PCSP) form within SimpleCFS™ beginning Jan 26, or as soon as it is live on the TMHP online portal. If you have any questions, please contact the SimpleLTC Support Team. With SimpleCFS™, you can automate your Texas Medicaid forms processes, simplify daily workflow, and improve financial performance for one or multiple facilities. SimpleCFS™ significantly decreases time spent creating and processing forms. Click here to sign up for a free SimpleCFS™ trial. Unable to join the PCSP webinair, our system checked OK to join, any suggestions? Hi Peggy, I apologize for the delay. Our presenter had technical difficulties, so we started shortly after 10 AM. If you missed the live webinar, the recording will be available later today on http://www.simpleltc.com/pasrr. Thanks!